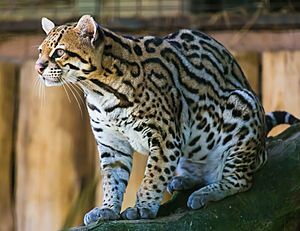 The ocelot (Leopardus pardalis) is a wild cat native to the southwestern United States, Mexico, Central and South America. It is listed as Least Concern on the IUCN Red List as the population is estimated to comprise more than 40,000 mature individuals and is considered stable. Its fur was once regarded as particularly valuable, but legal trade of its fur ceased decades ago. In the United States, it inhabits southern Texas and southern Arizona. 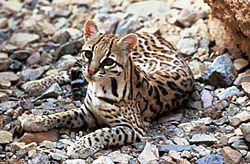 The ocelot's fur is extensively marked with solid black markings on a creamy, tawny, yellowish, reddish grey or grey background colour. The spots on head and limbs are small, but markings on the back, cheeks and flanks are open or closed bands and stripes. A few dark stripes run straight from the back of the neck up to the tip of the tail. Its neck and undersides are white, the insides of the legs are marked with a few horizontal streaks. 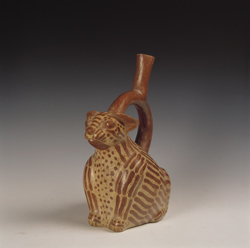 Its round ears are marked with a bright white spot. Its fur is short. Its eyes are brown but reflect golden when illuminated. 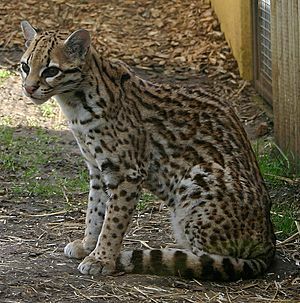 It is a medium-sized cat with a head-and-body length of between 55 and 100 cm (22 and 39 in) and a 25.5 to 41 cm (10.0 to 16.1 in) long tail. Females weigh 6.6–11.3 kg (15–25 lb) and males 7–15.5 kg (15–34 lb). The ocelot is usually solitary and active around twilight and at night. It scent-marks its territory by spraying urine. Territories of females rarely overlap, whereas the territory of a male includes those of two to three females. Social interaction between is minimal, though a few adults have been observed together, and some juveniles interact with their parents. In Peru's Cocha Cashu Biological Station, radio-collared individuals rested during the day in dens below large trees or other sheltered sites on the ground. They started to be active earliest in the late afternoon and moved between 3.2 and 17 hours until latest dawn, when they returned to their dens. 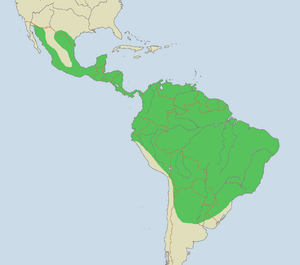 The ocelot is distributed extensively over South America, including the Margarita and Trinidad islands, Central America, Mexico and a small population in southern Texas. It inhabits tropical forest, thorn forest, mangrove swamps and savanna at elevations up to 1,200 m (3,900 ft). It prefers areas with relatively dense vegetation cover, but occasionally hunts in more open areas at night. Ocelots are carnivores and prey on small mammals, such as armadillos, opossums and rabbits, rodents, small birds, fish, insects and reptiles. An ocelot typically preys on animals that weigh less than 1 kilogram (2.2 lb). It rarely targets large animals such as deer and peccaries. An ocelot requires 600–800 grams (21–28 oz) of food every day to satisfy its energy requirements. The composition of the diet may vary by season. Ocelots have been observed to follow scent trails to acquire prey. Their usual pace of walking was about 300 m (980 ft) per hour when hunting. They moved up to 1.4 km (0.87 mi) per hour when heading to a known kill site or patrolling their territory. They wait for 30 to 60 minutes at a certain place, and then move on to a different place when unsuccessful. They tend to eat the kill immediately, and remove feathers before eating birds. A litter of one to three is born after a gestational period of 79 to 83 days. Females give birth in dens, usually located in dense vegetation. A newborn kitten weighs 200–340 g (7.1–12.0 oz). A study in southern Texas revealed that a mother keeps a litter in a den for 13 to 64 days, and shifts the young to two to three dens. The kitten's eyes open 15 to 18 days after birth. Kittens begin to leave the den at the age of three months. They remain with their mother for up to two years, and then start dispersing and establishing their own territory. 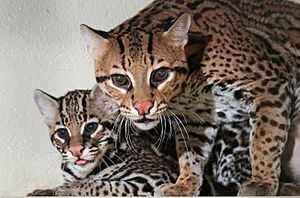 In comparison to other felids, ocelots have a relatively longer duration between births and a smaller litter size. Captive ocelots live for up to 20 years. 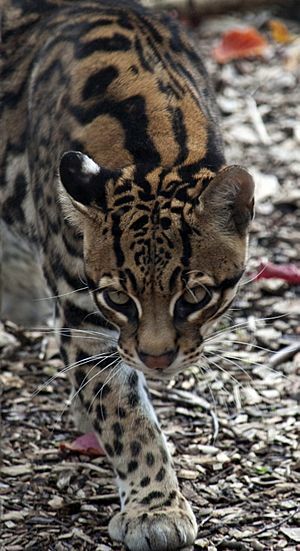 The destruction of habitat is the main threat to ocelot survival. In addition, it is sought by poachers for the illegal trade in body parts and skin, and killed in retaliation for hunting poultry. The U.S. ocelot population in south Texas has declined from 80–120 individuals in 1995 to fewer than 50 by 2013, with about half of ocelot deaths resulting from automobile accidents. Ocelot Facts for Kids. Kiddle Encyclopedia.